Eleven-year-old Tallien won yesterday’s major event at the Marsa Racetrack. This was the Prix De Vincennes final for French trotters registered in class Premier. This final formed part of the 58th meeting of the season made up of 13 races all for trotters. Yesterday’s card included also four other finals for French trotters. Twelve trotters lined up for the class Premier final. Truscott Du Guepre (Rodney Gatt) was the fastest horse at first, opening a small lead from Amour Du Loup (Michael Ellul), Ugo Des Jacquots (Mario Fenech) and Tallien (Melvin Farrugia). However, the early leader, Truscott Du Guepre, started to slow down when the front trotters turned for their final straight. Gatt’s horse ran out of steam and was overtaken by Tallien which registered its fourth win of the year from Amour Du Loup. Truscott Du Guepre had to settle for third place ahead of Ultra De Vindecy (Cliferty Calleja) and Titan d’Abo (Charles Camilleri). Tenor Du Passage, under the guidance of Frankie Abdilla, led all the way during the 2,640m distance of the Prix d’Enghien final for class Gold trotters. Tenor Du Passage obtained its second win in Malta from Vif Ludois (Charles Debono) and Uveo De Maza (Noel Baldacchino). Tyrol De Feugeres (Rodney Gatt) and Un Reve d’Or (Clint Vassallo) ended in fourth and fifth place respectively. There was a keen duel in the final metres of the Prix De Cabourg final for class Silver trotters between the early leader, Blue Winner (Noel Baldacchino), and Black Gold (Herman McKay) which a had a good sprint in the final straight. It was McKay’s horse which sealed its second win in Malta with Ultra Dag (Julian Farrugia), Balzan (Tony Demanuele) and Ami Toon’s (Claudio Refalo) also obtaining a good placing. As expected, in the Prix De Cagnes Sur Mer final, reserved for class Bronze trotters, Cesar Du Buillon (Rodney Gatt) took the lead after only few metres from the start and led till the end. Gatt’s trotter sealed its 12th win of the year and its fourth in a row from Bella De La Voire (Clint Vassallo) and Titan Des Tincques (Cliferty Calleja). Usolo De Beylev (Herman McKay) and Roc Magister (Kirsten Axisa) followed home in that order. It should be noted also that Cesar Du Buillon is the most consistent horse of the 2018 season. 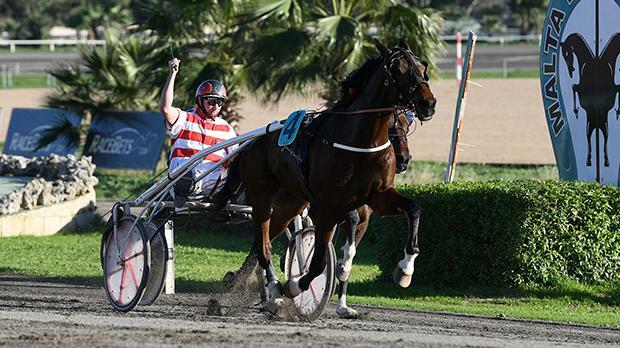 Chahuteur (Kurt Saliba) gained its third consecutive win in the Prix De Caen final for class Copper trotters. 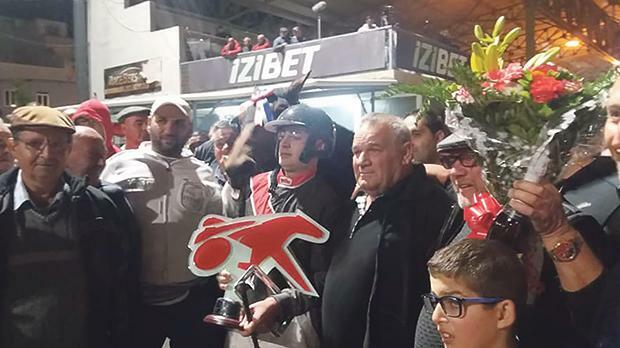 Saliba put this French six-year-old trotter in front around 700m from the finishing line and Chahuteur did not find any difficult to triumph from Cherie De Noyelles (Cliferty Calleja), Cirella De Kacy (Julian Farrugia), Desir De Jiel (Rodney Gatt) and Dagda (Charles Camilleri). At the end of these finals, the winning owners and drivers were presented with a trophy by Emmanuelle Morvillers, French Association Le Trot representative, in the presence of MRC chairman Edwin Borg.